FULTON, NY – Oswego County Opportunities, the community action agency for Oswego County, will hold its annual Giving Thanks fundraiser on November 2 at the Lake Ontario Convention, Event and Conference Center, 26 E. First St., Oswego. Members of planning committee for Oswego County Opportunities’ Giving Thanks celebration meet to discuss details for this year’s event. 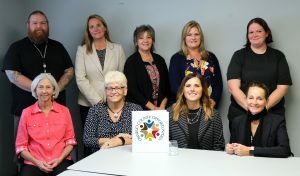 Seated from left are Executive Assistant Patricia O’Connor, board member Patricia Krauss, Development Coordinator Bridget Dolbear and Family Care Specialist Penny Foster-Pratt. Standing from left are Facilities Manager Christian Sweeting, Pamela Caraccioli of SUNY Oswego, a community representative on the committee, Human Resources Generalist Jo-Lyn Phillips, board member Crystal Perry and Operations Support Assistant Candra McFarland-Gawarecki. Other committee members include Executive Director Diane Cooper-Currier, Senior Director of Operations Betsy Copps and board member John Zanewych. Established more than 52 years ago, OCO offers more than 50 different human services programs that serve more than 20,000 people annually. These programs strive to eliminate the impact of poverty and increase the quality of life in Oswego County. That, combined with a staff of more than 500 employees, makes OCO one of the most vital organizations in Oswego County. OCO’s Giving Thanks event serves as a vehicle to highlight its many programs and services and as a fundraiser to ensure that OCO will be able to maintain and continue to make these programs and services available. In keeping with its theme of giving thanks the event will feature an assortment of autumn inspired food and refreshments. Food stations throughout the venue will offer attendees the opportunity to enjoy harvest season delicacies courtesy of area restaurants including; Alex’s on the Water, Canale’s Restaurant, La Parrilla, The Press Box, Mimi’s Drive-In, The Eis House, GS Steamers, and Tailwater Lodge. Additional stations will offer choices from CiTi Culinary Arts, Appledale Orchards, and OCO Nutrition Services. Wine and beer samples from Eagle Beverage will pair with the foods featured at each station. In addition to the tempting variety of food and beverages the planning committee has put together several prize packages that attendees can take a chance at winning. A Cayuga Wine Trail Holiday Shopping Spree for two complete with a one-night stay at the Gould Hotel in Seneca Falls, dinner, continental breakfast, and transportation to 10 wineries; an Evening Out in Oswego package that includes two tickets for the Oswego Lighthouse tour, a gift certificate for dinner, a $100 gift certificate for the Beacon Hotel and a $50 and a gift basket; and a Go SU! package that includes two prime location seats behind the players’ bench for an SU basketball game, parking pass, and a gift certificate for dinner. Advance sale tickets are $35 per person, $40 per person at the door and include food, refreshments, and beverage tastings. For more information or to purchase tickets. visit www.oco.org or call Dolbear at 315-598-4717, ext. 1082.